MicroGuard Safety Light Curtain | Pinnacle Triad Innovative Oil Storage Systems Products | The Bernard Company, Milford CT. The revolutionary safety light curtain from Pinnacle Systems. The MicroGuard safety light curtain is thin in design, fits into tight spaces, uses reliable infrared technology, solid state construction, is easy to install and continually visually communicates the system status with operators and plant personnel. The MicroGuard safety light curtain advantage is the advanced smart controller design that allows the operator and plant personnel to perform immediate visual checks on the system status. On the safety light curtain there are 50 diagnostic messages which provide an exact determination of the MicroGuard safety light curtain’s operational status on a continual basis. Messages are easily viewed from the safety light curtain message display on the front of the controller. The safety light curtain operator can verify the condition of operation and status of the system at all times. For the first time, the MicroGuard safety light curtain’s design allows a quick and easy resolution to system faults and maintenance concerns. Constant communication between the operator and the MicroGuard safety light curtain will save valuable operating time by reducing machine down time. The self-diagnostic capability allows the MicroGuard safety light curtain to trouble-shoot itself by identifying system faults. This constant operating evaluation allows problems to be immediately corrected. 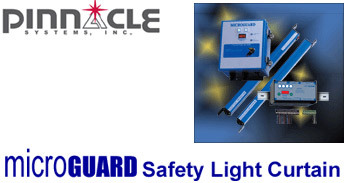 This ensures that each MicroGuard safety light curtain user will get maximum machine utilization. The MicroGuard safety light curtain is user friendly. Simple cable hook-ups are used to activate the MicroGuard safety light curtain. Power is common 120VAC, 240VAC, or 24VDC. The safety light curtain’s thin profile is easily mounted in tight spaces and is available in 30 sizes that can be adapted to any application need. The safety light curtain’s thin profile pylons feature 1/2” or 1” beam spacing with an easy alignment feature. Solid state modular NEMA IV (IP 65) construction is easy to maintain with snap-in circuit board construction. The safety light curtain lens covers are high impact plastic and are easily replaced. The redundant circuit and microprocessor design of the MicroGuard safety light curtain ensures safe, uninterrupted operation. The MicroGuard safety light curtain is also designed for immunity to noise, light, weld flash, and other ambient light sources. The MicroGuard safety light curtain is available in either a Metal Box Controller Module or a compact 35 mm DIN-rail Controller Module. TRIAD safety light curtains incorporate extensive testing and burn-in to establish a high degree of product reliability and safety. TRIAD safety light curtains utilize the diverse redundancy design concept. This gives the safety light system a higher level of redundancy and control reliability. The safety light curtain’s two microprocessors are of different design, and the microprocessor or parallel programs are run and made up from different instruction sets written by different programmers. Self-Checking Circuitry TRIAD safety light curtains self-check every 20 milliseconds. The safety light curtain self-checking is the ability to electronically verify that all of the safety light curtain systems critical internal circuit components and their redundant counterparts or back-ups are operating properly. Redundant Captive Contact Safety Relays Redundant safety light curtain relays assure safety if an output relay should fail. 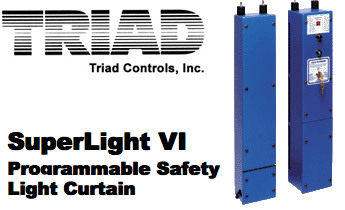 The SuperLight VI safety light curtain utilizes safety relays which have force-guided contacts. The contacts are mechanically locked together so that if one set of contacts weld, the other contacts cannot change state. If one should fail, code 5-6 will be displayed on the safety light curtain diagnostic display. Extra Safe Design Provides two methods of safety light curtain fail-safe design. One utilizes two microprocessors and two captive contact relays, and one uses four watchdog timers monitoring the safety light curtain system and the captive contact relays. External Diagnostic Display Standard on all TRIAD safety lights is the "Quickview Diagnostic Display." Alpha-numeric display shows status and fault codes of the safety light curtain unit. This is an excellent safety and maintenance feature of the safety light curtain. Control Reliable System Critical components of the SuperLight VI safety light curtain are duplicated so that a single component failure will not cause an unsafe condition. If a component does fail, the units self-checking circuitry recognizes the situation and initiates a safe stop of the machine. Powerful Infrared Light Source TRIAD safety lights utilize powerful, safe, and predictable infrared light as its sensing source. This gives the system greater reliability and enhances machine utilization by minimizing nuisance trips and shutdowms caused by dirt, coolants, lubrication mists and machine oils. TRIAD safety light curtains are highly immune to EMI, RFI, and ambient light conditions and are unaffected by strobe lights and weld flash generated light sources. Extensive Testing TRIAD safety light curtains incorporate extensive testing and burn-in to establish a high degree of product reliability and safety. 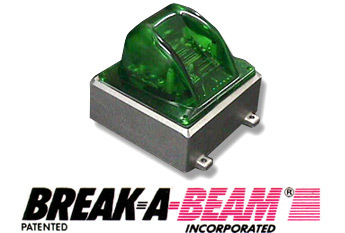 Break-A-Beam® is a linked infra-red light beam housed in an ergonomically designed palm button enclosure that supplies an output signal when an operator lays their hands in the contoured nest and "breaks the beam". Break-A-Beam® units are designed as replacements for mechanical palm buttons in existing applications or for new machines. Palm button models are available with 120VAC and 24VDC power options. All palm button units are equipped with 4PDT relays to provide 3 normally open and 3 normally closed outputs. Break-A-Beam Palm Button Actuator with power on "ready light". Fault light will appear if there is an operational problem. Palm Buttons support up to 14ga wiring. All palm buttons supplied with three pole double throw relay (3P2T), gasket and screws. Palm buttons available in four models. Break-A-Beam® M-200 Actuator palm button unit. Anti-Tie-Down/Anti Repeat control boards include (2) form C relay outputs. Adjustable pedestal for mounting a Break-A-Beam® Palm Button Operator Station.